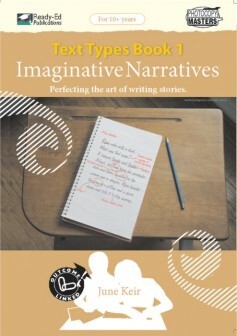 Imaginative Narratives is the first of four books in the series Text Types, written by June Keir. The series is designed to help students understand and appreciate the idea that texts differ from one another in terms of their purpose, structural features, language features and the medium in which they appear. 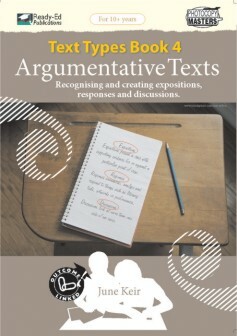 The series introduces students to a range of text types and in this way enables them to become confident in identifying a text as a particular type and qualifies them to form expectations about its content, form and objectives. 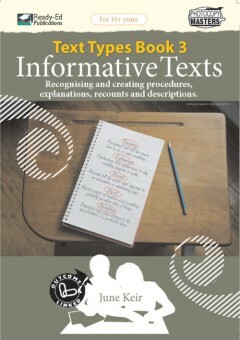 The series also functions to help students begin to write different types of text confidently and incorporate the different features of each text type accurately. 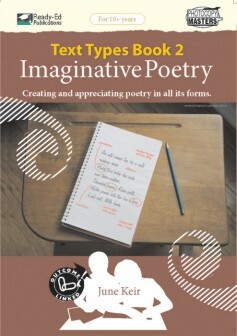 The first book in the sereis introduces students to the text type; narrative. It exposes students to a number of engaging stories written by the author and by popluar children’s storytellers so that they are able to recognise what a narrative looks like. Carefully contstructed activities which are outcome linked, help students understand how characters, settings and storylines are created so that they can begin to plan and finally write their own narrative. To motivate students to write, the book is clearly divided into sections to highlight the idea that creating a narrative happens in stages. The solutions for the activities are provided at the back of the book. This series is highly recommended for any teacher teaching English in upper or lower secondary school.